Two self-acclaimed pastors, Chukwuka Stephen and Ejim Stephen, have been arrested in Ogun state for allegedly killing their elder sister’s husband, Peter Chukwuyem. 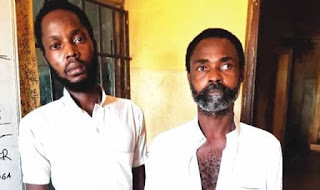 The state police command alleged that the suspects, who are siblings and indigenes of Delta state, had trailed their brother-in-law to his farm on February 5, 2019 and macheted him to death for denying them the use of the frontage of his house for their church activities. The state Police Public Relations Officer, Abimbola Oyeyemi, who confirmed the incident on Thursday, said the killing was reported at the station by the wife of the deceased and their teenage daughters. DSP Oyeyemi said that Chukwuyem had brought Chukwuka, 43, and Ejim, 39, from their village in Delta state to his residence at Papa Ibafo, Ogun state, to squat with his family. The police spokesman said the suspects then began using a space in front of the house for their church activities but when their conduct was no longer tolerable to their in-law, he sent them away, which led to their nursing of animosity against him. Shocking words: I was shocked when I was told to give money, I said money for what? Money to the committee that visited us? “On February 5, 2019, the deceased went to his farm with two of his teenage daughters in the morning and met the two suspects at the farm. But because of the presence of the two girls, they couldn’t attack him for fear of being exposed. “In the evening of the same day, the deceased went back to the farm alone and the suspects, who had been waiting for him at the farm, accosted him and macheted him to death. “It was when the deceased didn’t return home on time that his wife traced him to the farm and met his dead body. She subsequently went to the Ibafo police station to lodge a complaint. “The two brothers were later arrested by the police through the accounts of the two daughters, who informed the police that they had seen the men earlier on their father’s farm. “On interrogation, the two suspects initially denied killing their brother-in-law, but when they were confronted by the daughters of the deceased, they confessed killing him in his farm because he deprived them of continued usage of the frontage of his house for their church activities,” the police spokesman added.